What is a ring main? 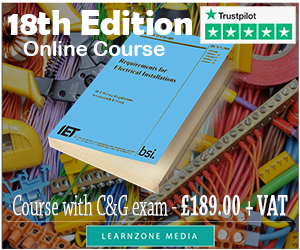 Within the electrical industry, the ring main circuit (sometimes ring main, or ring final circuit) is an electrical wiring technique that is most commonly used in the UK. The ring circuit is made up of two radial circuits connected to the same series of accessories within the circuit. This arrangement allows the use of conductors with smaller cross-sectional areas compared to a regular radial circuit arrangement. 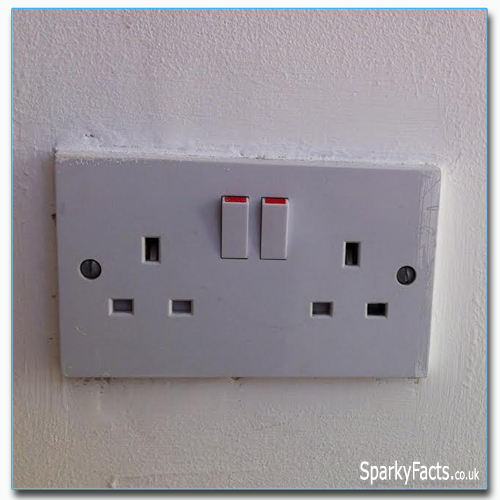 It is also a requirement that all connected appliances must be individually fused (usually within the 13A plug). 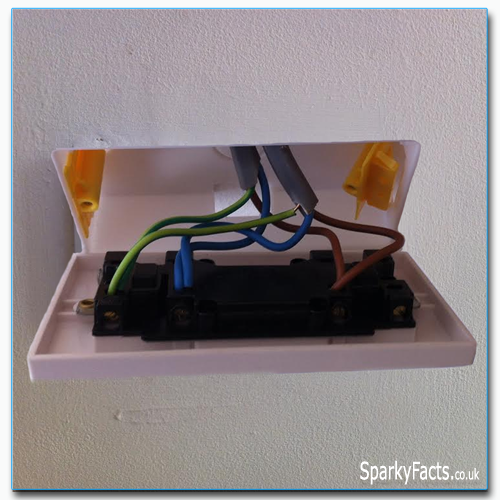 This means that every single accessory will have wires coming to it and wires leaving from it towards the next accessory and eventually terminating the circuit at the consumer unit. In order to achieve this, all wires (Line, Neutral and Earth) will be doubled up in the terminals of sockets, FCU `s or and in the terminals of the consumer unit. The images bellow show a socket and an FCU with the circuit going in and out. Please observe that there are two brown wires (Line), two blue wires (Neutral) and two green/yellow ones (Earth). It is the same arrangement in the consumer unit as well. Since the circuit goes around and ends at its starting point, the protective device (usually an MCB) will have two brown wires in its terminals (as demonstrated in the picture bellow), and the Neutral and Earth bars will also have two wires in their corresponding terminals for the Neutral and Earth wires. As you can see, wiring a Ring Main is relatively easy. 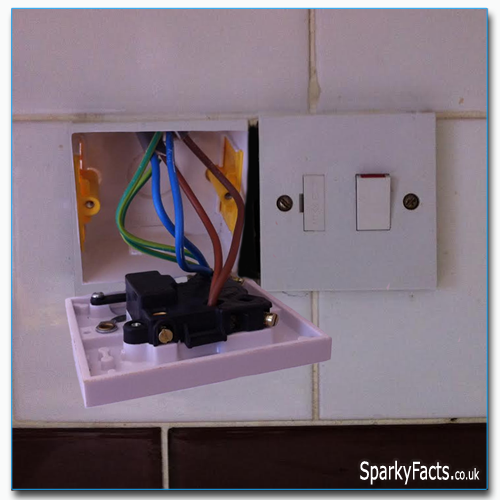 All you have to do is to start at the consumer unit with a length of appropriate cable, go around your area and "pick up" all your sockets and FCUs and then return to the consumer unit to end the circuit. 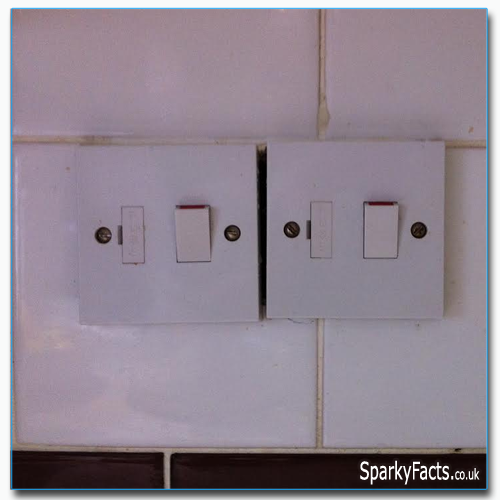 If you look at the wiring diagram above, you can see that the middle socket has another socket “branched off” from it. This is what is called a “spur”. Even though the spur is the part of the same ring main circuit, it is not part of the ring itself, because the socket which is spurred off only has one cable going to it. You can clearly see on the wiring diagram that a cable is going to it but nothing going from it! It is just a “branch-off” from the Ring Main to another socket. The spur can be taken from any socket or FCU within the Ring Main circuit. The spur not only supplies a socket but may supply FCU`s as well. The rule is that you can spur off one socket from a point within a Ring Main circuit or unlimited number of FCUs fused to 13A. 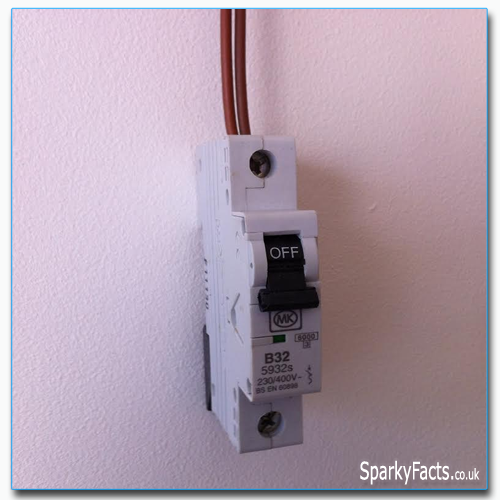 The main purpose of a spur is adding an extra socket on to an existing Ring Main circuit. Its simplicity makes it a great arrangement for that use. As you can see, it eliminates the need to wire a socket all the way back to the a consumer unit, but the nearest Ring Main socket is used instead. As you can see from this table, a common arrangement is to use the 2.5 mm2 Twin&Earth cable protected by a 32A Type B MCB. This arrangement allows for the coverage of 100 m2 which is more than enough for domestic use. That is exactly why this arrangement is the preferred one for domestic properties. Usually there would be one ring main for all the ground floor accessories and another one for the first floor accessories. Circuits wired with 4mm2 cross-sectional are only used in commercial and industrial premises where cable runs are much longer and the larger cross-sectional area is there to take voltage drop in account.